In early 1952, at the invitation of Warren McCulloch, Ashby attended the 9th Macy Conference where, as well as demonstrating the homeostat, he met with other cyberneticians including Norbert Wiener, Harry Pitts, and Claude Shannon. 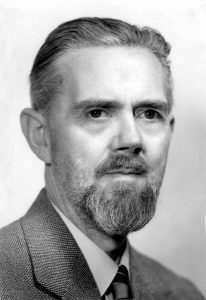 Ashby was a founding member of the Ratio Club (1949-1958), a Cambridge-based interdisciplinary group of researchers interested in cybernetics whose members included Alan Turing. Ashby wrote two influential books, Design for a Brain (1952) and An Introduction to Cybernetics (1956), the latter introducing “the Law of Requisite Variety” and influencing the work of Roger Conant and Stafford Beer. In 1960 and at the instigation of Heinz von Foerster, Ashby was offered a faculty position in the Departments of Biophysics and Electrical Engineering, University of Illinois at Urbana-Champaign. He remained there until his retirement in 1970. The British Library holds the papers of W. Ross Ashby. The centerpiece of this archive is a remarkable series of 25 notebooks in which Ashby recorded his thoughts and observations over a period of 44 years from 1928 until 1972. A unique analytical record of scientific and creative endeavour, they provide a fascinating insight into his entire working life in cybernetics including the genesis of the homeostat, his work on “ultrastability” and the “Law of Requisite Variety.” In addition there are index cards, notes, offprints and lecture slides and a small but important collection of correspondence with individuals such as Norbert Weiner and Warren McCulloch along with a much-celebrated letter from Alan Turing. The Ashby papers have been arranged and described and selectively digitized. A portion of the W. Ross Ashby Papers have been digitized for this project.